Call or contact your friendly Abberley charter broker here for assistance in planning an unforgettable yachting vacation in Milos and the Cyclades. The best way to see the island’s dramatic coast and spectacular volcanic rock formations is by chartering a yacht. A private yacht charter gives you the opportunity to explore the region in complete luxury. Cruise past Kleftiko and marvel at the breathtaking white rocks that rise out of the azure waters like iced cakes. Anchor your yacht off Sarakiniko and dive into the impossibly blue sea lapping the white pumice rocks, or head to the blue sulphuric waters at Papafragas. 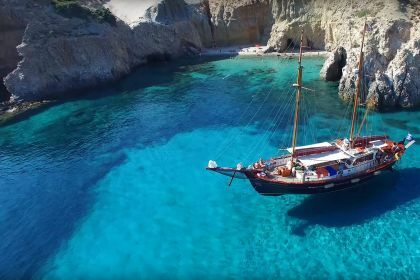 Because Milos has become a popular destination with Greeks, accommodation in the summer months can be hard to find – which is no problem for you, as you recline on deck of your private sailing yacht, motor yacht or catamaran, luxuriating in pampered paradise. If you want a respite from the mind-blowing seascapes you can only enjoy from the deck of a yacht, there’s plenty to do onshore as well. 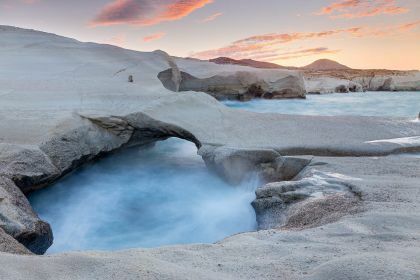 Besides sailing to spectacular Kleftiko and Sarakiniko and visiting the island’s many other exquisite beaches, Milos offers some intriguing historical sites. Visit the early Christian catacombs in the northern Trypiti area, where you’ll find ancient tombs carved out of the porous rock. In Adamas, the main harbour town, you’ll find the remnants of a World War II bomb shelter as well as an ancient Roman amphitheatre. And, of course, there’s the field near Tripiti where the ancient marble statue of Venus de Milo was discovered in 1820. This famous statue is now on display in the Louvre in Paris. Insider Tip: You can see a good replica of the Venus de Milo statue in the archaeological museum at Plaka. Even if you simply love the gourmet flair of your private chef (some yachts provide Michelin-star chefs) it’s still worth having the unique experience of dining in an authentic Greek taverna. The island is packed with excellent tavernas and restaurants, so finding a good meal isn’t difficult. 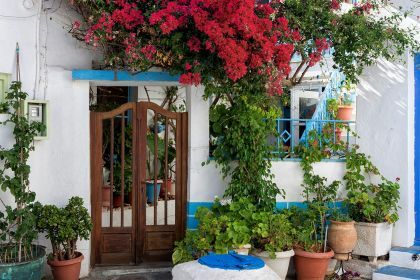 In Pollonia, head to family-run Enalion, where they serve freshly caught seafood and delicious salads made with homegrown produce. Another good choice is Gialos, where you can try proper taramasalata, grilled calamari, fish and prawns. In Tripiti, try Ergina, which has beautiful sea views from its terrace and offers traditional yet sophisticated meals, and Barriello, which is known for its fresh salads and cheese platters. Don’t leave the island without trying its signature dish, watermelon pie. After a day of sailing around the coast of Milos, step off your private yacht at nightfall and enjoy the nocturnal goings-on of the island. Adamas has an array of waterfront tavernas and bars, including Akri, which has some of the best harbour views from its open-air terrace. In the capital, Plaka, Utopia Café has spectacular views, especially at sunset, and stays open late. Pollonia in the north has lots of waterfront tavernas and music bars. 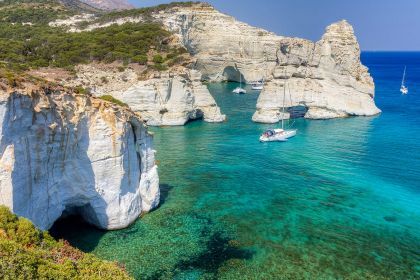 Ready for you next unrivalled yacht charter around Milos and the Greek Islands? Whether you’re interested in a crewed catamaran, a large sailing yacht, an elegant motorsailer or a luxury superyacht, our friendly Abberley charter broker is at your service. Get a taste of what the Greek islands offer with a day charter experience, or go all out with a two week yachting extravaganza – either way, we can guarantee an unsurpassed yachting experience in this exquisite part of the world. Drop us a line here or give us a call for a yacht charter experience in Milos that you won’t forget in a hurry.